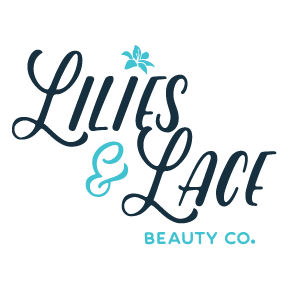 Introducing Lilies and Lace beauty co.
We’re so excited to introduce Lilies and Lace beauty co. to you all! My name is Jordanna and I am the creator and owner. When I first started out sub-contracting my hair styling services, my company name was simply- “Jordanna Koppe wedding and special event hairstyling” Obviously that name didn’t last long as it was super long and a quick thought when I was making my business facebook page. It was quickly changed to be known as “JK Hair Designs” and so it stayed that way for 4 years. It was a super successful company and I could have just kept running with that name, but let me tell you why I wanted to rebrand. Where did the idea of the name come from you ask? Well, “Lilies” because they’re my favorite flower (I even had them in my bouquet on my wedding day) And also because if I would have had a girl I would have named her Lilian, and her nickname would have been Lily. Lace because I LOVE the look of the lace wedding dresses, and also it flowed really well with Lilies. “Beauty co.” because I want to be able in the future to offer more services other than only hair styling. We’re so excited to kick off the new year with our new brand, and meet all our bride to be’s! Thank you for stopping by our site and make sure you follow us on our social media platforms (linked in the bottom of each website page) for our most up to date work and blog post links to come. Happy holidays and we hope you get some R&R time with loved ones!